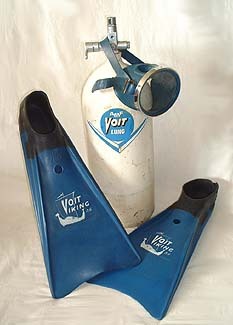 Voit Viking fins, with 40 cubic foot Voit tank and blue oval mask. 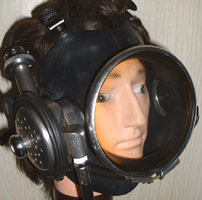 Scuba gear manufactured by Voit was used extensively in the TV series "Sea Hunt", circa late 1950's to the early 1960's. 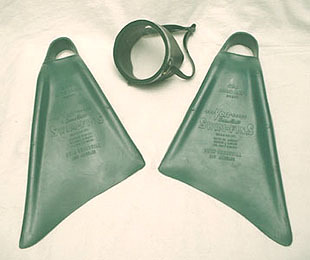 1950's Churchill swim fins and Sea-View mask. Churchill fins were one of the first fins available in the United States and were used by the U.S. Navy in the 1940's and 1950's. They were later sold by Voit. One of the first "dive computers", made by SOS of Italy in the early 1970's. This one is complete, with the original wrist strap, box and instruction manual. 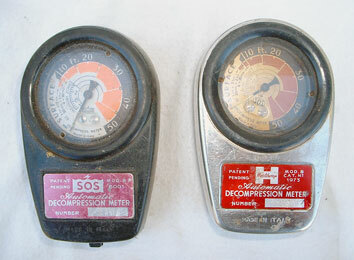 These meters were marketed by Scubapro, Healthways, and a dozen other European manufacturers. 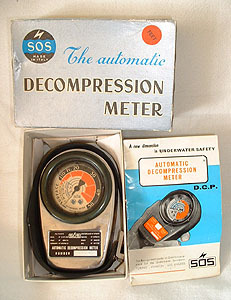 Two hard to find examples of decompression meters. The SOS model on the left has a plastic case, and the one on the right was sold by Healthways. One of my favorite things to collect are wrist type depth gauges, especially high-quality units. Here are some examples from the late 1950's to the 1970's. 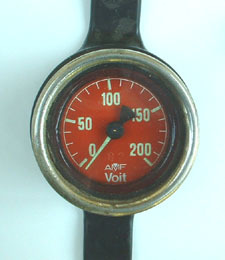 On the left is an AMF Voit gauge from the 1960's. The U.S. Divers gauge on the right was made in France, and dates to the early 1960's. 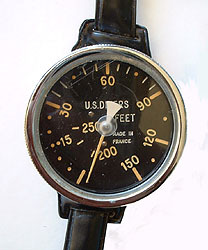 Some early SCUBA equipment was available in France before it was manufactured in the U.S.
Two examples of Mega Sport wrist depth gauges, made in Italy. 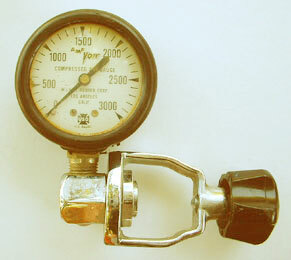 These only measure to 50 feet, and were designed for use with rebreathers, probably designed for military use. 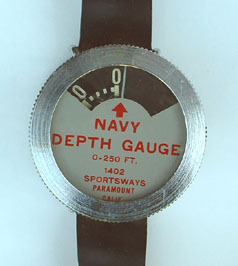 The unusual Sportsways Navy depth gauge with revolving numbers (on the left) was used by "Mike Nelson" in the TV series "Sea Hunt" in the early 1960's. 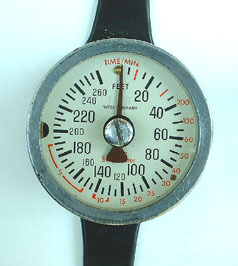 The Swimaster gauge (center) reads to 260 feet, and was manufactured in West Germany. It is liquid filled, and the face includes markings for no decompression limits. 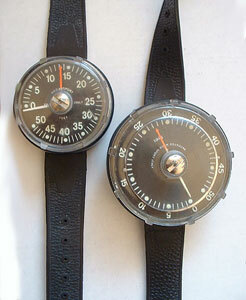 Shown on the right is Scubapro's finest gauge ever, from the 1970's. It is helium filled and reads up to an incredible depth of 500 feet, way beyond the limits of SCUBA diving. It was made in Italy by SOS. 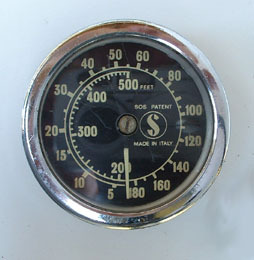 Every SCUBA manufacturer marketed their own tank pressure gauge at one time or another. Here are three examples from U.S. Divers, Voit, and Scubapro. 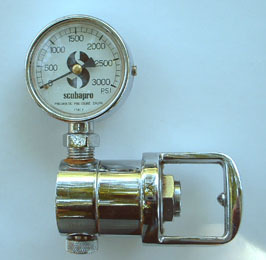 The Scubapro unit is unique in that it has an automatic (pneumatic) yoke screw. Pressure from the tank itself extends the yoke to tighten it on the tank. 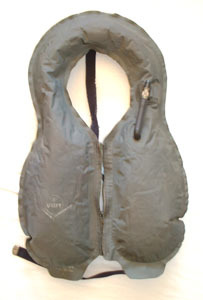 Horsecollar BC's gained popularity in the mid-1960's, for more precise buoyancy control. The unusual Voit BC on the left was made in a military green color, almost identical to the shade used by the US Navy. The Fenzy BC on the right is probably the most famous horsecollar BC and the most sought after by collectors. 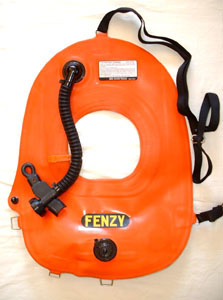 The Fenzy featured a built-in air bottle that inflated the vest by simply turning on the valve. 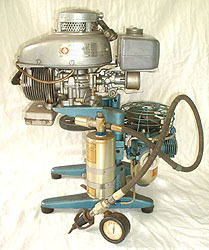 This late model unit is probably from the 1980's, and features an oral inflator/back-up regulator as well. Huge diving light, made by USPEC Company. This unit measures approximately 6 1/2 inches in diameter. 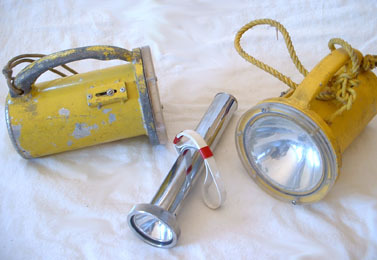 Vintage dive lights from the 1950's and 1960's. The yellow ones were made by Darrell Allan of Belmont, California. They are made of solid aluminum with thick plexiglass lenses. The chrome flashlight is an Aqualux made by La Spirotechnique of France and dates to the 1950's. US Divers sold the same model, labeled as Navy Flashlight, as shown in the 1957 US Divers catalog. 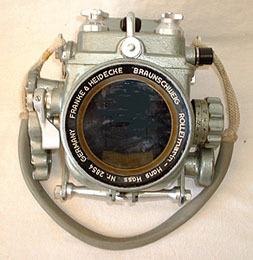 Left: One of the most famous underwater camera housings ever made was the Hans Hass Rollei marine housing, for the Rolleiflex camera. The heavy duty aluminum casting was built to last a lifetime. The Healthways Mako Shark on the right was available in the 1960's. 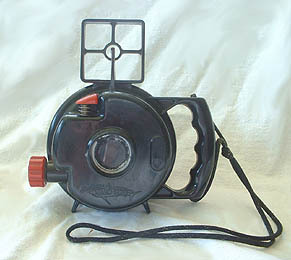 These cameras were also marketed by other companies under other names, such as the Nemrod Siluro 120. It was designed to be used underwater (without a housing) and was pressure tested to 100 feet. 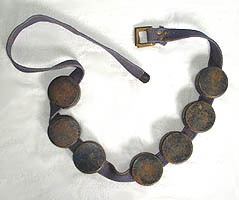 Left: Early 1950's US Divers one inch weight belt with round, cast iron, 1 pound weights. Very scarce item. Can be seen in the 1953 US Divers catalog. 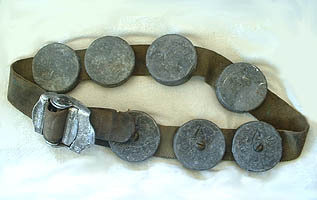 Right: Mid 1950's "Mer-Man" weights and weight belt. 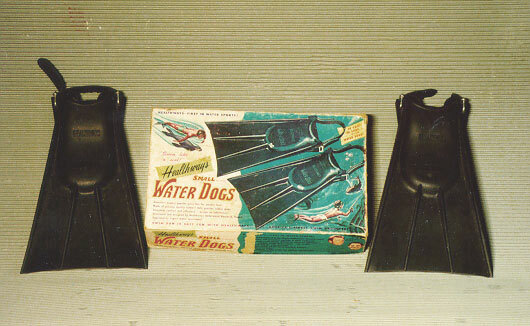 These were sold by Amerman Divers Supply out of Portland, Oregon. The belt buckle is a "special aircraft corrosion-resistent safety buckle - a slap of either hand and the belt drops off". The weights are secured with a large brass slotted screw. Cornelius High Pressure SCUBA Compressor from the mid 1950's. The Cornelius Company was making aircraft high pressure compressors during World War II, and were later involved in vending machines. They entered into the SCUBA business in the 1950's by converting some of their high pressure pumps and adding filtering systems. 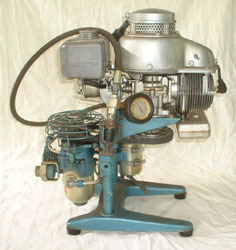 This one is model 32-R-1505 and is powered by a 1 1/2 HP single cylinder two cycle gasoline engine, made by Power Products. It is capable of pressures up to 2500 PSI and 0.6 cubic feet free air per minute. Scott Hydro-Pak full face mask with built in second stage regulator. 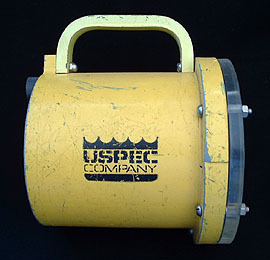 These were introduced in about 1954 and were considered the "Cadillac" of scuba gear at the time. 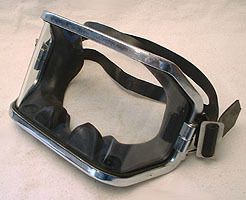 US Divers Aqualung Professional Dive Mask. Has very unique "wrap-around" one piece tempered glass lens. This mask sold for $11.95 back in 1961. The glass had a tendency to crack when subjected to quick changes in temperature. These are the earliest Healthways fins I have ever seen. To have purchased them with the original box was incredible! Made of blue natural rubber. In the 1950's, the Voit tank came in a cardboard box. No one ever saved the box, which makes this example a very rare find.